The southern end of Kyoto’s Higashiyama (Eastern Mountain) district is my favorite area of the city for a walk. 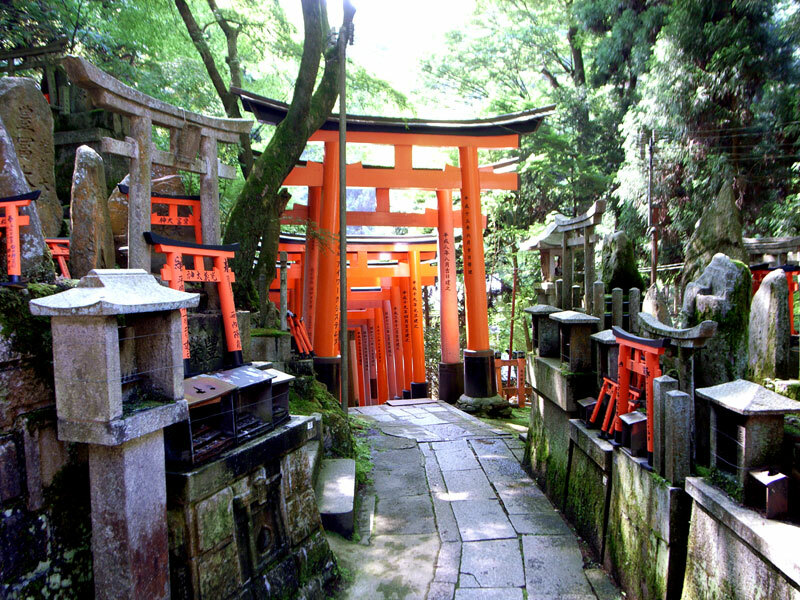 Nestled against the mountains are some of the city’s most atmospheric temples and Fushimi-Inari Taisha, a fascinating complex of shrines scattered across a wooded hilltop. If you want a taste of the mysterious side of Japan, this walk is for you. The walk starts at Tofuku-ji, a lovely temple complex that is often overlooked by visitors to Kyoto. After exploring Tofuku-ji, we will work our way through some narrow streets and alleys before we enter the woods and climb the northern slope of Mt. Inari, home of Fushimi-Inari Taisha. Here, we enter a world of vermillion torii (Shinto shrine gates), hidden shrines, strange stone figures and, according to some, legions of ghosts and spirits. After exploring this shrine complex for a while, we will descend the west side of the mountain, pausing to admire the excellent views across the whole of southern Kyoto. Finally, we come out at the base of Inari-san, where we visit the main halls of the shrine before boarding the train to return to downtown Kyoto. This walk takes approximately four hours and can be done by anyone in good physical condition. The guide will meet you at a hotel in Kyoto or at a meeting point at Kyoto Station. The endpoint of the walk is Fushimi-Inari Taisha, which has bus and train connections to all parts of Kyoto. You can extend this walk to create a six-hour tour (¥36,000 per group). For the six-hour option, you can include part of our Walk 3 (Classic Southern Higashiyama). If you’d like to do an eight-hour tour (¥44,000 per group), you can combine this with the full Walk 3 (Classic Southern Higashiyama). We suggest starting this walk at 9:00 am because inoshishi (wild boar) have been spotted in the mountains near Fushimi-Inari Shrine and they are most active in the late afternoon.